A memorial service for Susan will be held at the Springfield UU Church on November 8, 2015, at 3 pm, with a reception to follow. Rev. M’ellen Kennedy will officiate. We hope that You will be able to join us for a celebration of Susan’s life. Our Small Group Meetings will be starting again in September. Small Groups are an opportunity for friendship and spiritual growth. Groups of usually no more than 10 people get together to listen to each other’s ideas and share. Each meeting has a specific topic and is led by a trained facilitator. The groups give us a chance to get to know each other in a more unhurried way than coffee hour or a quick conversation before church. The groups have relational agreements to create an environment conducive to community building and spiritual exploration. Those who participated last year say they thoroughly enjoyed their time together and treasure the insights gained and stories shared. We will be meeting September through May. If you have questions or wish to sign up you can contact Ellen Allman 802-463-5129 or ellenallman@gmail.com. There are two ongoing groups which meet once a month on Thursdays. There is also a drop-in group facilitated by Rev. M’ellen usually once a month on one of the Sundays when she is in Springfield. Come try out a group on Sunday, September 20 from noon to 1:15, after the coffee hour. The theme of the group this time will be Connecting with Nature and it will be facilitated by Rev. M’ellen. If there is more interest, we’ll be starting additional groups. And Rev. M’ellen will offer a training at an area UU congregation most likely in October for those who would like to learn more or possibly become a facilitator. To celebrate our being back together after summer recess, we’ll have a potluck lunch. All are welcome. Please bring a dish to share if you are able. The Caring Committee will provide dessert. It will be great to see old friends and welcome new. September 13th, after the service. Five Gardens, Lunch and Plants – Suggested Donation $20. Schedule, directions, carpooling info on registration. Melissa and Irwin Post grow fruits and a wide variety of vegetables for year-round eating and for a small number of CSA customers. Their garden features many raised beds, “mini-greenhouses” covering some of the beds, and a 24’x32′ unheated greenhouse. The gardens of Nina and Herb Jamison feature a forest setting with low stone walls, perennial beds connected by pebble paths, stone steps, stone seats and whimsy throughout. 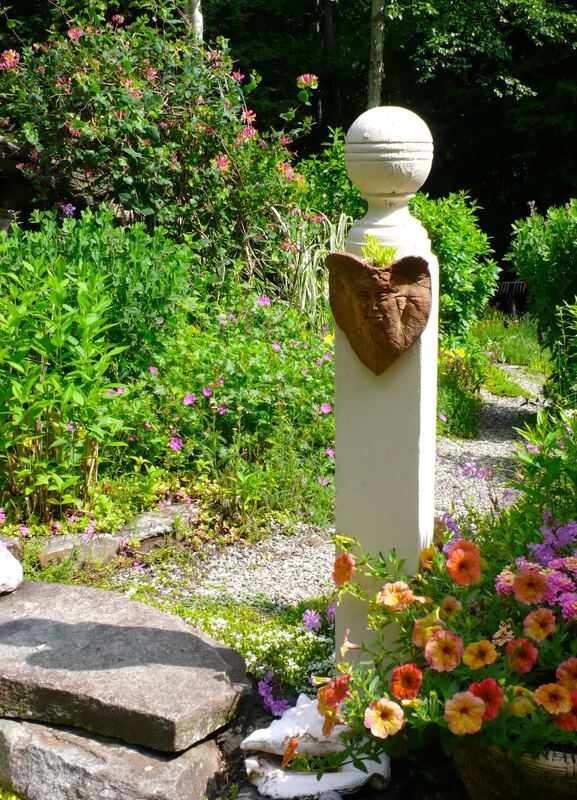 Enjoy the lavender lined path, wilds interspersed with planting beds and two woodland walks. We’ll return to wander the paths of Glen Williams’ amazing in-town garden on just ¾ of an acre. Glen is known for his extensive hosta collection. He’s also been adding ladyslippers, an assortment of annuals, and anything else that catches his fancy. Jennifer Hassenbuhler welcomes us to her rambling back yard that goes down a large bank to a stream. Functional aspects of plantings are important and we’ll see plants for sunshine and shade as well as light colored plants such as impatiens that seem to glow in the evening light. Our last stop includes lunch at Evelyn Beebe’s, followed by a tour that includes both formal and informal sun and shade gardens, a small orchard, and views of meadows, Claremont and Sunapee. The tour, with time for lunch, runs from 8 a.m. through 1:30. Suggested donation is $20. which includes lunch and plants. Please call 885-1156 or email dkemble@vermontel.net to sign up. Full details on directions and carpooling will be provided. Please invite your friends, and help spread the word by sharing this event via Facebook. Plant Sale, Food, Crafts, Flea Market, Arts Show, Entertainment! Our 5th annual May Festival will be held on May 16th and includes our popular plant sale. There will be annuals, perennials, vegetables and herbs for your garden. Our garden experts will be on hand for consultation and to answers questions. Lunch will be available at our deli-style café. Vendor booths include food crafts, woodworking, jewelry, fabric crafts, flea market items and more. Space is still available for those wishing to participate, but please let us know by May 10th if you want a space. Booth space is $15.00. Tables can be rented for an additional $5.00. Our congregation will have a flea market booth and we need items to sell. If you have “stuff” to donate, please bring it to the church by May 16th. We will be collecting things in the club house. The festival is a rain or shine event. Set up time on May 16th is 7:30 to 8:45 Vendors may drive up to their booth space for unloading. Please call 885-1156 or e-mail springfieldfair@gmail.com to reserve a space. The glory of May in Vermont! We made it through what was one of the coldest, hardest winters I recall. In fact, my husband tells me it snowed yet again in Vermont this morning. I myself am writing from sunny southern California where I have been attending to (rescuing really) my elderly, disabled aunt and uncle who experienced a crisis due to an unscrupulous caregiver. I am so grateful for the prayers and support from all of You. Miracles abound and my aunt and uncle are becoming stable and safe. Thanks! I look forward to my return soon to my home in Vermont and to Spring! 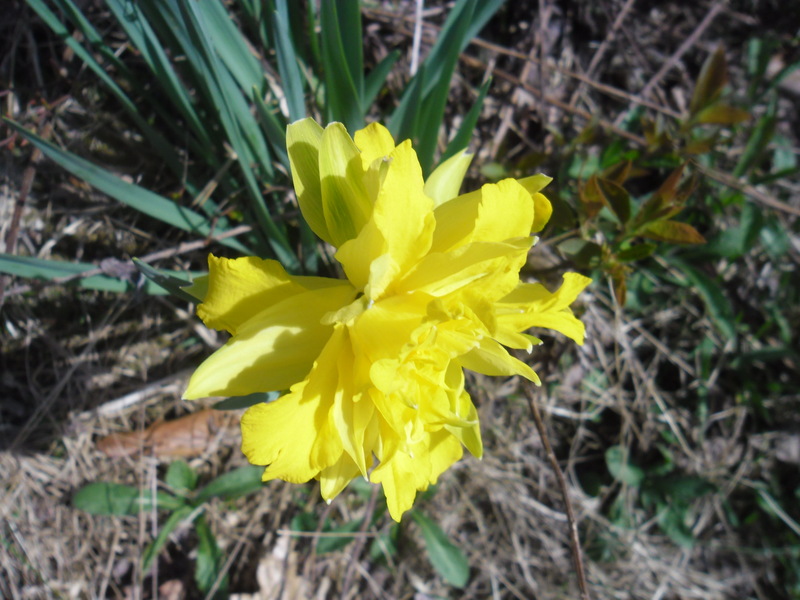 Yes, the glory of it – wild onions, hepatica, wild ginger, spring beauties, wood thrush calling, barred owls, and so much more. This month in our worship services, we’ll explore the themes of Home, The Divine Mother and the lessons from the life of the Buddha. Here is a poem by Mary Oliver for us to savor until we meet again. Merry Spring! As people who are caring for this church community by serving on the board of trustees, we work to balance a focus on the details of running this organization with a focus on spirituality. They go hand in hand. The details this month include fiscal things like pledging and budget, and organizational things like nominating people for vacant positions, contracting with our minister for another year, and so on. On the spiritual side, we are reminded of the sacred nature of our work together. These different focuses feed each other, are necessary parts of the whole. Come to the Annual Meeting with both of them in mind. Come, and join your voice to the whole, to our Blessed Community. My friends, let us give thanks for Wonder. that infuses all things now and forever. Join us for our Annual Meeting and Potluck. The potluck begins at 6 and the meeting at 7. It is always a great time!